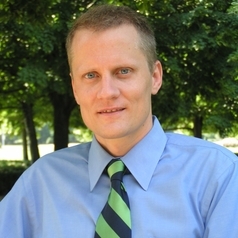 Allen Rostron, who joined the faculty in 2003, teaches and writes in the areas of constitutional law, tort law, products liability, and conflict of laws. Before becoming a teacher, Rostron worked in Washington, D.C. as a Senior Staff Attorney at the Brady Center to Prevent Gun Violence, where he was part of a nationwide litigation effort that included lawsuits brought against gun manufacturers by several dozen major cities and counties. Rostron began his career working as a law clerk for Judge Thomas S. Ellis III of the U.S. District Court for the Eastern District of Virginia, and then as a litigation associate at the Cravath Swaine & Moore law firm in New York City. Professor Rostron’s research and writing has had a significant impact on several areas of law. The Supreme Court of Wisconsin relied on one of his articles in a decision in which it became the first court in the nation to impose proportional or “market share” liability on manufacturers of lead paint. In another article, Professor Rostron suggested a new approach to regulation of high-powered sniper rifles, and that approach was subsequently enacted into law in the District of Columbia and incorporated into proposed federal legislation introduced in the U.S. Senate.